Please join Columbia Libraries/Information Services’ Center for Digital Research and Scholarship, the Faculty of Arts and Sciences’ Division of Social Science and the Division of Humanities for “Research Without Borders: Publishing Without a Publisher? Scholars Are Doing It For Themselves“, our kick-off event of the academic year in our Research Without Borders panel discussion series. This event will take place from 3-5pm on Wednesday, September 24, 2014 in the Ivy Lounge on the First Floor of Columbia’s Faculty House. It is free and open to the public. No RSVP is required. Why are scholars choosing to self-publish their research, and how? What are the benefits of self-publication or “doing it yourself” publishing? Which academic disciplines are engaging with these publishing methods? How does the academy perceive DIY or self-publishing? In this panel discussion, speakers will explore the ways in which scholars are self-publishing or DIY-publishing their research, and why they choose to do so. Topics of discussion will include the different forms that scholarly self-publishing take, who in the academy is self-publishing, and how academia views such efforts. Tara McPherson is Associate Professor of Critical Studies at USC’s School of Cinematic Arts and an affiliated faculty member in the American Studies and Ethnicity Department. Her research focuses on media, gender, race, affect, place, digital humanities, early software histories, and the development of new tools and paradigms for digital publishing, learning, and authorship. She is the lead PI on the Alliance for Networking Visual Culture’s new authoring platform Scalar, and the Founding Editor of Vectors, a multimedia peer-reviewed journal affiliated with the Open Humanities Press. Her book, Reconstructing Dixie: Race, Gender and Nostalgia in the Imagined South, received the 2004 John G. Cawelti Award for the outstanding book published on American Culture. Shannon Mattern is Associate Professor in the School of Media Studies at The New School in New York. Her research and teaching address how the forms and materialities of media are related to the spaces (architectural, urban, and conceptual) they create and inhabit. She writes about libraries and archives, media infrastructures, the material qualities of media objects, media companies’ headquarters and sites of media-related labor, place branding, public design projects, urban media art, and mediated sensation. She is author of The New Downtown Library, which was supported by the Graham Foundation for Advanced Studies in the Fine Arts. You can find her at wordsinspace.net. Alberto Pepe is the co-founder of Authorea, a collaborative word processor and repository for scientists. He is also a data consultant and a Research Associate at Harvard University, where he recently completed a Postdoc in Astrophysics. At Harvard, he was a fellow of the Berkman Center for Internet & Society and an affiliate of the Institute for Quantitative Social Science. He holds a Ph.D. in Information Science from the University of California, Los Angeles with a dissertation on scientific collaboration networks. Gregg Gordon is President and CEO of the Social Science Research Network (SSRN), a leading multi-disciplinary online repository of scholarly research in the social sciences and humanities. Its eLibrary database has 560,000 papers from over 260,000 authors and users have downloaded close to 80 million full text papers since inception. Prior to helping Michael C. Jensen found SSRN in 1994, Gregg worked at KPMG and entrepreneurial companies in technology and health care. Gregg speaks around the world and writes regularly about scholarly research and the changes needed to create innovative research faster. Alondra Nelson is Dean of Social Science and professor of sociology and gender studies at Columbia University, where she has served as director of the Institute for Research on Women, Gender, and Sexuality. An interdisciplinary social scientist, she writes about the intersections of science, technology, medicine, and inequality. Her books include Body and Soul: The Black Panther Party and the Fight Against Medical Discrimination; Genetics and the Unsettled Past: The Collision of DNA, Race, and History; and Technicolor: Race, Technology, and Everyday Life. Her latest book, The Social Life of DNA, will be published next year. Nelson has been a visiting fellow of the Max Planck Institute for the History of Science, the BIOS Center at the London School of Economics, and the Bavarian American Academy. She sits on the editorial board of Social Studies of Science, serves as an advisor to the Data & Society Research Institute, and serves as a member of the NSF-funded Council for Big Data, Ethics, and Society. This event is the first event this academic year in our speaker series Research Without Borders: The Changing World of Scholarly Communication. It is co-sponsored by Columbia University Libraries/Information Services‘ Scholarly Communication Program, the Columbia Faculty of Arts and Sciences’ (FAS) Division of Social Science and the FAS Division of Humanities. Join the discussion on Twitter at #rwob and @ScholarlyComm. To watch a live webcast of the event, and for more information about Research Without Borders, visit the Scholarly Communication Program website at scholcomm.columbia.edu. 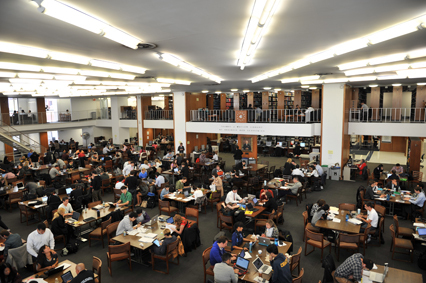 This entry was posted in Columbia University Libraries and tagged cdrs, research without borders on August 20, 2014 by Kathleen.